The dsp.FilteredXLMSFilter System object™ computes output, error and coefficients using filtered-x least mean square FIR adaptive filter. Create the dsp.FilteredXLMSFilter object and set its properties. fxlms = dsp.FilteredXLMSFilter returns a filtered-x least mean square FIR adaptive filter System object, fxlms. This System object is used to compute the filtered output and the filter error for a given input and desired signal. fxlms = dsp.FilteredXLMSFilter(len) returns a FilteredXLMSFilter System object, fxlms, with the Length property set to len. fxlms = dsp.FilteredXLMSFilter(Name,Value) returns a FilteredXLMSFilter System object, fxlms, with each specified property set to the specified value. Enclose each property name in single quotes. Unspecified properties have default values. Specify the length of the FIR filter coefficients vector as a positive integer value. This property is nontunable. Specify the adaptation step size factor as a positive numeric scalar. Specify the leakage factor used in a leaky adaptive filter as a numeric value between 0 and 1, both inclusive. When the value is less than 1, the System object implements a leaky adaptive algorithm. The default value is 1, providing no leakage in the adapting method. Specify the coefficients of the secondary path filter model as a numeric vector. The secondary path connects the output actuator and the error sensor. The default value is a vector that represents the coefficients of a 10th-order FIR lowpass filter. Specify the estimate of the secondary path filter model as a numeric vector. The secondary path connects the output actuator and the error sensor. The default value equals to the SecondayPathCoefficients property value. This property is not tunable. Specify the initial values of the FIR adaptive filter coefficients as a scalar or a vector of length equal to the value of the Length property. Specify whether to lock the filter coefficient values. By default, the value of this property is false, and the object continuously updates the filter coefficients. If this property is set to true, the filter coefficients do not update and their values remain the same. [y,err] = fxlms(x,d) filters the input x, using d as the desired signal, and returns the filtered output y and the filter error err. The System object estimates the filter weights needed to minimize the error between the output signal and the desired signal. You can access these coefficients by accessing the Coefficients property of the object. This can be done only after calling the object. For example, to access the optimized coefficients of the fxlms filter, call fxlms.Coefficients after you pass the input and desired signal to the object. The signal to be filtered by the filtered XLMS filter. The input, x, and the desired signal, d, must have the same size and data type. The filtered XLMS filter adapts its coefficients to minimize the error, err, and converge the input signal x to the desired signal d as closely as possible. The desired signal, d, can be a variable-size signal. You can change the number of elements in the column vector even when the object is locked. The System object locks when you call the object to run its algorithm. Filtered output, returned as a scalar or a column vector. The object adapts its filter coefficients to converge the input signal x to match the desired signal d. The filter outputs the converged signal. Difference between the output signal y and the desired signal d, returned as a scalar or a column vector. The objective of the filtered XLMS filter is to minimize this error. The object adapts its coefficients to converge towards optimal filter coefficients that produce an output signal that matches closely with the desired signal. To access the filtered XLMS filter coefficients, call fxlms.Coefficients after you pass the input and desired signal to the object. Generate noise, create FIR primary path system model, generate observation noise, filter the primary path system model output with added noise, and create FIR secondary path system model. Use the dsp.FilteredXLMSFilter System object to compute the filtered output and the filter error for the input and the signal to be canceled. Identify an unknown system by performing active noise control using a filtered-x LMS algorithm. The objective of the adaptive filter is to minimize the error signal between the output of the adaptive filter and the output of the unknown system (or the system to be identified). Once the error signal is minimal, the unknown system converges to the adaptive filter. Create a dsp.FIRFilter System object that represents the system to be identified. Pass the signal, x, to the FIR filter. The output of the unknown system is the desired signal, d, which is the sum of the output of the unknown system (FIR filter) and an additive noise signal, n.
Create a dsp.FilteredXLMSFilter System object to create an adaptive filter that uses the filtered-x LMS algorithm. Set the length of the adaptive filter to 32 taps, step size to 0.008, and the decimation factor for analysis and simulation to 5. The variable simmse represents the error between the output of the unknown system, d, and the output of the adaptive filter. With each iteration of adaptation, the value of simmse decreases to a minimal value, indicating that the unknown system has converged to the adaptive filter. Kuo, S.M. and Morgan, D.R. 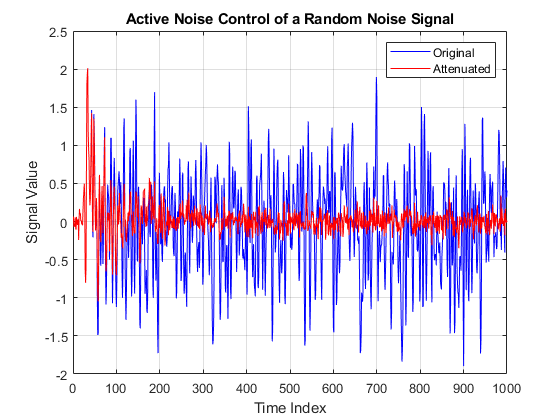 Active Noise Control Systems: Algorithms and DSP Implementations. New York: John Wiley & Sons, 1996. Widrow, B. and Stearns, S.D. 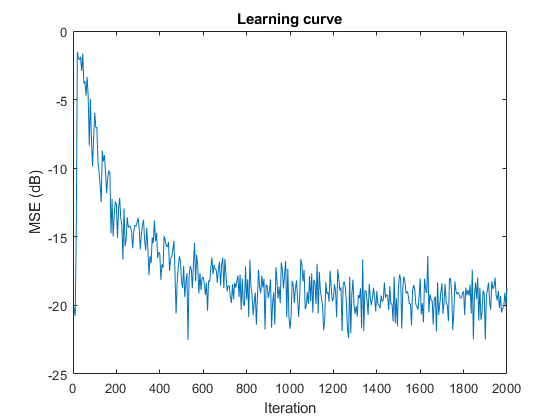 Adaptive Signal Processing. Upper Saddle River, N.J: Prentice Hall, 1985.